All transactions are safe and secure with a reliable history in online purchasing behind each of our associates. Buy the Daisy Dukes of Hazzard General Lee 01 t-shirt to own Dukes of Hazzard clothing and merchandise. The white Daisy Dukes of Hazzard t-shirt shown on the left is the perfect tribute to the classic TV show and Bo and Luke's attractive cousin. 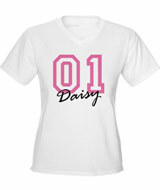 The front features the General Lee's number, "01", with the name Daisy printed underneath. In addition to the 01, a Confederate flag design originally appeared on the car's roof. Grab your keys and hit the road in this exciting piece of merchandise that let's everyone know that you're a good old boy, or girl. Buy this tee with a matching Dukes of Hazzard model car. In addition to the Daisy Dukes of Hazzard General Lee 01 tee above, browse the Dukes of Hazzard Clothing Gallery for more apparel like men's and women's clothes, kids shirts or hoodies.